Run Out of Records to Research? Many avid researchers hit a stumbling block in identifying more about their ancestors, and they do not know how to overcome it. They get stuck for long periods of time not being able to find historical documentation. You must know how to keep your own research going. What do you do after you have exhausted all the records at your disposal online or in local repositories? You need to stay abreast of the existing records that you have not yet accessed. You need to research historical records at the same time you are hunting for your ancestor. ArchiveGrid will help you learn about records. Review search results for any person who would have either known your ancestor or lived nearby. Do not make the mistake of passing over the potential to find even the smallest bread crumb. Each bread crumb when put together will give you a half a slice or maybe even close to a whole slice of bread. Also, one bread crumb may indirectly lead to the third or fourth bread crumb which reveals more than the second crumb you find. One bread crumb is insignificant by itself, but when joined with all the rest, the picture is more complete. People of interest to research more in depth include, the family of the person who owned your ancestor, the clergyman of the church the owner attended, and even neighbors. 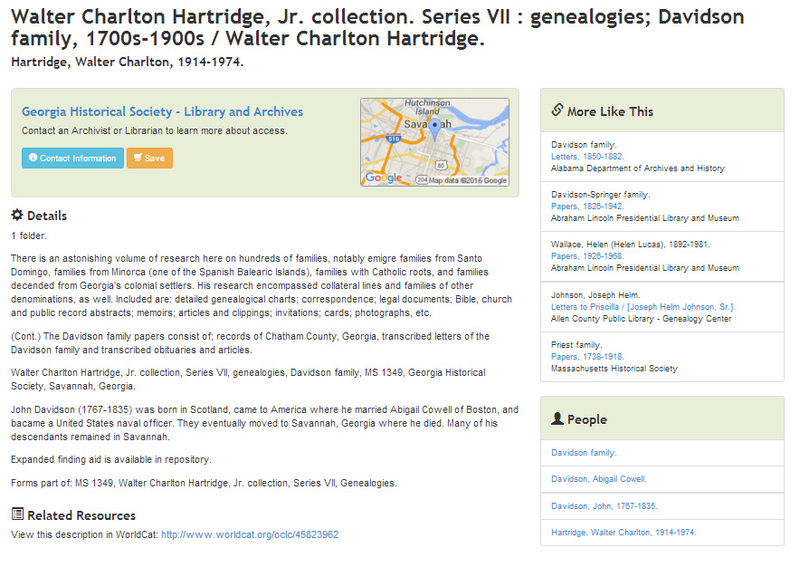 The papers of Walter Charlton Hartridge, Jr. contain the research of hundreds of families from as early as 1767. Perhaps among the “detailed genealogical charts; correspondence; legal documents; Bible, church and public record abstracts; memoirs; articles and clippings; invitations; cards; photographs, etc.” there is more to discover about people of color. Always click the green button labeled “Read More” to see the complete description of a resource. To the right of the record descriptions, you will find links to similar records. We have also discovered links which have led to the complete record accessible online. When you find a record that interests you, click “Contact Information” to find access to it. Your ancestor may have had interactions with local political groups, the military, railroads, schools, clubs, or other businesses and organizations. Perhaps studying their records will provide important clues or even mention the name of a family member. 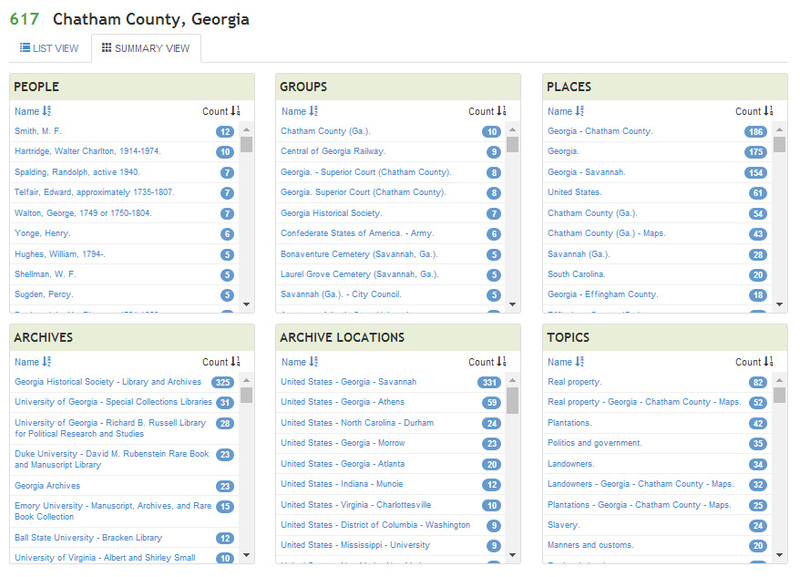 Among the groups records for Chatham County, Georgia is the collection, Chatham County, GA Records 1782-1837 which is a microfilm that contains a register of free persons of color from 1826-1835 available through the Georgia Historical Society. The Georgia Historical Society provides research services. Also, ask us first. We may already have access to a resource that you need. The collection of Robert Bolton family papers, 1761-1817 contains records from Georgia and South Carolina. If you have been following our recent posts on the courthouse sales of enslaved people, you should remember that enslaved people could be mentioned in deeds and bills of sale. This collection contains both. This boxed collection of papers are also open for research through the Georgia Historical Society. 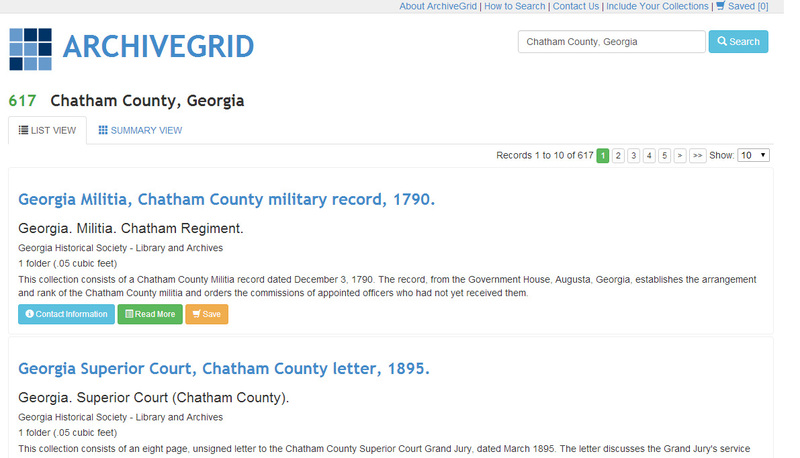 ArchiveGrid is a major resource for discovering historical records which are not available online. We will highlight the three remaining sections in the Summary View in an upcoming post. 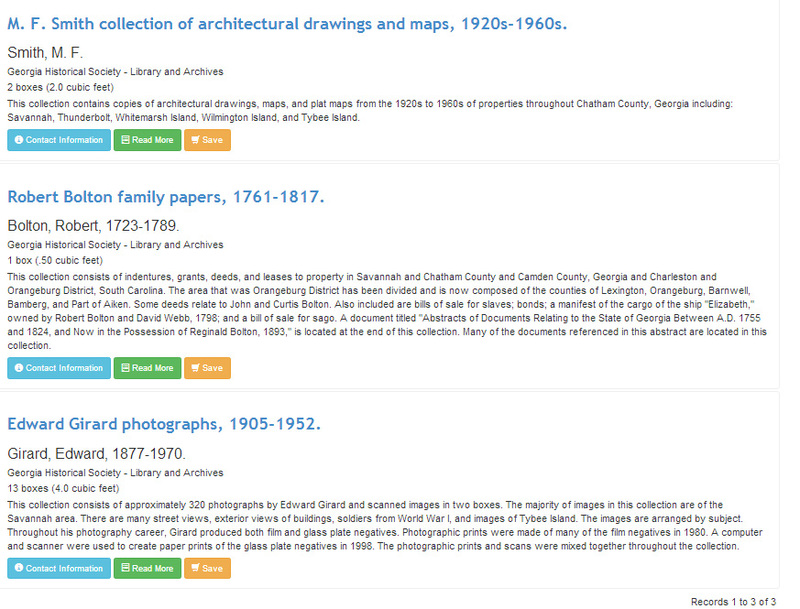 Take a moment to search ArchiveGrid to find new resources that you did not know about before. Let us know which are of most interest to you on the Facebook post for this article.